I have plans, but they are only sketches right now, and are only as accurate as I can tell. I would love to see this done and would be willing to help in any way. Once upon a time I emailed Syd Mead about a floor plan. But just got a nice reply from an assistant saying there was no floor plan, it was just four rooms in a row. But if someone could create one, based on viewing the film, that would be fantastic! If only you could see what I've seen with your eyes. . . The layout always confused me, would love to see an accurate plan. I'm with you Gaff; especially when we know that Ridley moved things around all the time . It's difficult to get a grip on the spacial arrangement and spread of the apt. 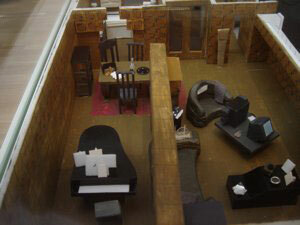 I think the 3D model is the closest I have seen, minus a few things. for one you could look over to the dining room from the bathroom. The Final cut box set extras, especially Dangerous Days, has some new and better lit shots to work from. I am convinced their was a floor plan because Mentor Huebner's set drawings are consistent with the film set. The breezeway is also missing as part of the apartment. I also would have included the elevator, hallway, and stairway. I've seen that model posted before but get blown away every time i see it. Stunning. I spent a week after all... thanks for the insight guys, and its fascinating to see we all all use the same or similar sources. 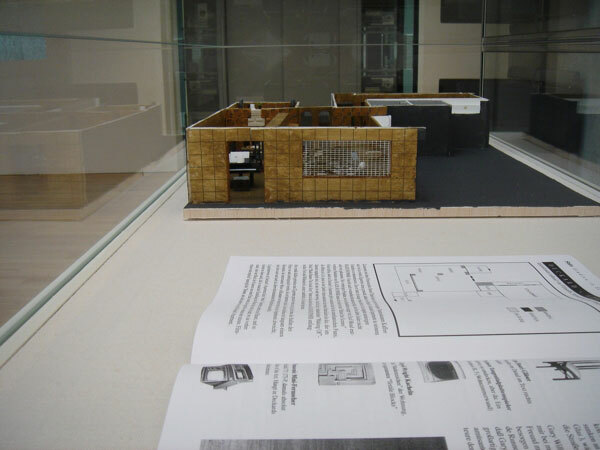 The architectural model was a good STARTING POINT, and i have made allowances for the fact i do think Ridley Scott moved the walls around. I drew it in 1/10 scale and am now in the process of using SKETCHUP to walk around a three d version and check my dimensions. I will keep you posted. OK, after much conversation, i am settling on a print size of 24 inches by 36 inches for the floorplan of the apartment. Incidentally i arrived at a length of 68 feet from the main entry door all the way to the furthest wall visible in the BALACONY shot, width on MY calculations is 51' 4". At ANDY's suggestion i am adding the elevator and the walkway from there to the front door. Will keep you all posted. Sounds good; looking forward to see your project take form. Commencing work on the 24x36 sheet version of the floorplan, simultaneously with the 1/6 scale. Final apartment size is roughly 60'x40'. Very Exciting! From what you have shown me so far, these should be pretty impressive. Turn away from the amp ...just kidding of course (saw your feedback quote). Sounds good to me, I'm sure others will chime in...but you have my total admiration to tackle such task; it's not easy. 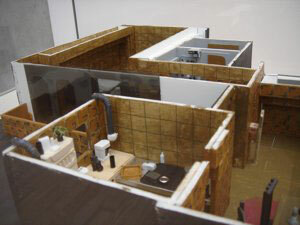 i have been planning on building a to scale replica appartment as a part of my project wear i am building places from my favorite films and piecing them togethter into a single building, your floor plans would be a great assistance in my plan so if you are willing would you send a link or something of the sort? thanks! "I've seen things you wouldn't believe. Attack ships on fire off the shoulder of Orion. I watched C-beams glitter in the dark near the Tannhauser gate. All those moments will be lost in time, like tears, in rain. Time to die." Welcome aboard cOmedian...I'm also eager to see these floor plans and other projects of yours! please enjoy and be patient... i am getting to the finished product! As this is a project i am working on, i trust the images will be used for references only. Hmmmm...I need to spend some time with this. Very cool.